Some people know science is fun. Others need to be convinced. A stage show combining math, science, and art, How to Catch a Mouse has entertained thousands of audiences. Balloons are used to construct a Rube Goldberg-style mousetrap intended to solve the problem of a mouse on the loose. Many student volunteers are used to aid in the construction of this working machine. Student knowledge of how machines work and their eagerness to set their trap in motion make this an enjoyable show for everyone involved. To introduce or reinforce concepts about the nature and structure of simple machines. To present an unusual art form to students. Children of all ages from kindergarten through middle school can benefit from this program. Presentations to younger grades focus on the concepts of simple machines working together and encourage problem solving skills through the use of common objects. The names and functions of the basic machines are stressed. In addition to the basics, older children are presented with a bit more information on the forces in nature that affect the way machines work. In the mid 1990s, Larry Moss, a fulltime computer programer and part time children’s entertainer, decided it was time for a change. He returned to school with the goal of combining his loves of science, entertainment and education. 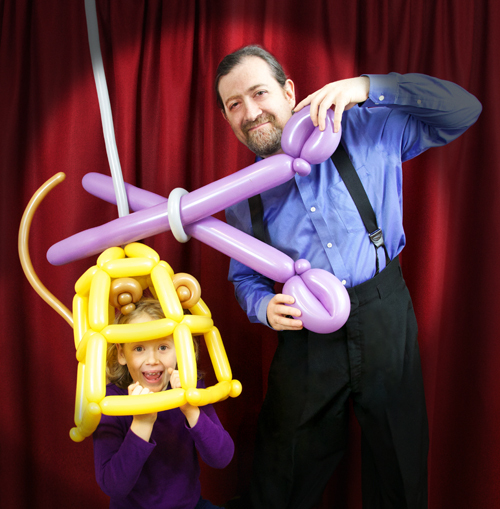 While working on his master’s degree in elementary education at the University of Rochester, a parent in a local school familiar with his work posed a challenge: teach science through the use of balloon art. This was the opportunity he had been looking for. He could apply his studies with his own interest in math and science. In 1996, How to Catch a Mouse was written as a presentation for a single elementary school class. The response to the first performance was so positive that Larry decided this concept needed to be developed further for larger audiences. It evolved from a simple presentation to a theatrical stage show suitable for elementary school assembly programs and children’s museums. Today the show is being performed across the United States. How to Catch a Mouse: uses Graphene theme by Syahir Hakim.